The Landsat 8 satellite captured this image of the London Array, the world's largest offshore wind farm. In this photo, taken on April 28, 2013, the white dots are wind turbines. Giant wind turbines appear as white specks across the Thames Estuary in the United Kingdom, in this satellite photo of the London Array, the world's largest offshore wind farm, released today (Jan. 21). The wind farm, which became operational on April 8, 2013, is located 12 miles (20 kilometers) from England's Kent and Essex coasts. The London Array's 175 wind turbines can generate a maximum of 630 megawatts of power, which is enough to power 500,000 homes, according to NASA officials. 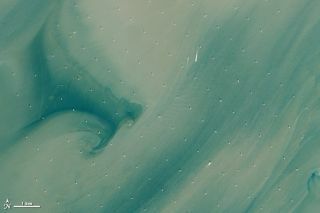 Tan-colored sediment swirls through the waters of the Thames Estuary, located where the River Thames meets the North Sea. The sediment is runoff washed out by the River Thames, NASA officials said. The London Array's wind turbines are spread out across 40 square miles (104 square kilometers), each positioned to harvest the prevailing southwest wind. The turbines are separated by roughly 2,100 to 3,900 feet (640 to 1,200 meters), and stand 482 feet (147 m) tall. Cables buried beneath the seafloor connect the wind turbines and transmit power to two offshore substations and one onshore station, according to NASA officials. The London Array, the world's largest offshore wind farm, is located in the Thames Estuary, where the River Thames meets the North Sea. The satellite photo above is a closeup of the area marked by a white box in this image. The London Array's wind turbines sit on two natural sandbanks, where water can reach depths of 80 feet (25 m). This site in the Thames Estuary was chosen because of its proximity to onshore power grids and because it does not disrupt shipping lanes that cut through the area. Construction of the next phase of the London Array is currently in progress, and the wind farm is expected to eventually grow to cover 95 square miles (246 square km). The London Array has been heralded as a way to reduce annual carbon dioxide emissions in the United Kingdom. Officials involved with the project say the wind farm could reduce carbon dioxide emissions by 900,000 tons, which is equivalent to the emissions of about 300,000 automobiles. But, those critical of the London Array have expressed concern over the wind farm's impact on wildlife in the area, including red-throated divers and other bird species.